The London Tower complex opens at 9am. The Tower of London closes between 4:30pm or 5:30pm (depending on the season). You can visit the Tower of London anytime throughout the year. We are comparing Tower of London Ticket with Crown Jewels Exhibition Prices from leading ticket suppliers and Try to find you Cheap tickets prices on the market. The Tower of London Ticket with Crown Jewels Exhibition is a package that allows you to discover the multi-layered historic complex of the London Tower. It allows you to explore the tower's premises on your own itinerary, take part in a 60-minute guided tour and take a look at some of the most fascinating exhibitions in the United Kingdom. Witness the opulence of the British Crown Jewels, consisting of diamonds, sapphires, pearls and other jewellery. Furthermore, the tower used to be the site cold-blooded executions and ruthless tortures, which you will be able to learn about as you tour its premises. Among other places, the Tower of London was where many public executions took place, including those of two Henry Tudor's wives. A visit to the Tower of London is a great activity for fans of history, medieval architecture and all those who are interested in London's past. With children's activity trails, the Tower of London offers entertaining opportunities for kids, too. Your Experience With Tower of London Ticket with Crown Jewels Exhibition? Pay a visit to one of the oldest and most iconic tourist attractions of the capital of Great Britain. Walk the grounds of the famous complex that served as a palace, a prison and a fortress. Learn the history of the London Tower, beginning with its construction, which was ordered by William the Conqueror, the winner of the Battle of Hastings in 1066. Explore grounds where many executions took place, including the one of Anne Boleyn, the 2nd wife of Henry VIII. Once inside the London Tower, take time to admire Crown Jewels of the British royals. In addition, you can take a free guided tour led by Yeoman Warder, commonly referred to as "Beefeater." During the tour, you will learn a lot about the activities at the court designed to outmanoeuvre the opponents. Learn the background story about the ravens inhabiting the London Tower and why they are so well taken care of. What Tower of London Ticket with Crown Jewels Exhibition Includes? Admission fee to the Tower of London. A complimentary 60-minute Beefeater guided tour. Entry to exhibitions held in the tower, including the Crown Jewels collection. Unlimited access to free Wi-Fi. Options to view re-enactments of the events that took place in the past. Free maps available at the entrance. An overview of one of the most historic places in England. Trace history of the fortress which began with William the Conqueror, the winner of the Battle of Hastings. Visit the place where Anne Boleyn, the 2nd wife of Henry Tudor, lost her head. In general, travellers have a high opinion about their visit and indicate that this historical site is a must see. A visit to the London Tower is especially entertaining for people interested in history. Travelers Reviews about Tower of London Ticket with Crown Jewels Exhibition? Rates of former visitors of this attraction are consistently poitive - 4.6 on Get Your Guide, 4.5 on Viator and 4.5 on TripAdvisor. People that conducted the tour of the complex point out that you need to allocate a lot of time to make the most of the visit. Also, comments agree that guides are knowledgeable, passionate and friendly. The Tower of London is accessible to visitors in wheelchairs. You need to show printed voucher at the entrance to the Tower of London. Depending on the provider you choose, you may be able to refund your ticket is the cancellation is made in advance. Note that you may need to wait in long lines to enter the Tower of London during the summer months if you don't arrive early. To shorten the waiting time, head to the "group ticket" counter. Try to allocate at least 3 hours for the visit. 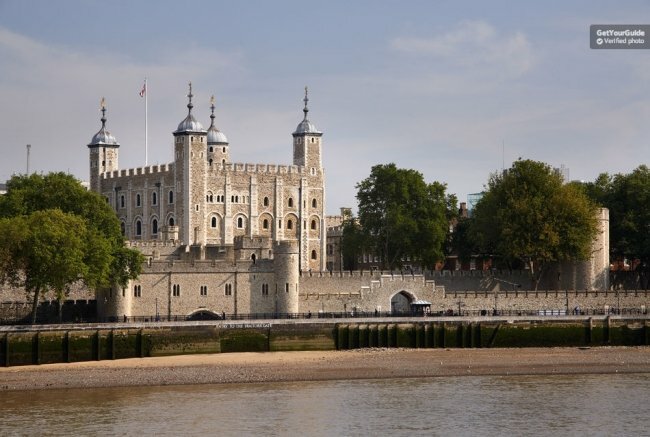 Address: the Tower of London is located on St Katharine's & Wapping, London.